This TAS is generally very similar to the previous pirohiko's TAS. The routes he created were all well organized, and there was virtually no way to modify them to accomplish faster record. It's no exaggeration to say that all the rest of the play, except for the part where the wall-clip was used at Winters, was inspired by his play. Pressing B once (outside battle) brings the party status screen. On this screen, the Random Number Generator (RNG) is used once every frame. It is used everywhere, but reduces the use for the long time by this TAS as much as possible because step stops. During a battle, moving in the menu once uses the RNG once, and that process takes 2 frames usually. Therefore, manipulating the RNG before a battle by certain ways is faster than moving the cursor in the battle. Because stepping on the border which determines whether the game generates an enemy uses the RNG, stepping over the border again and again is an effective way to manipulate the RNG quickly. While doing the manipulation, Ness & co. look like walking in zigzag. This is why I named this method "zigzag stepping". You can ignore some of hotspots by releasing the arrow key periodically. In the early part of the run, Ness skips Starman Junior battle. This is one of major use of stutter-stepping. The pattern to perform the skip is to press arrow key in one frame, then release it in one frame, and repeat. Skip sandwich makes Ness' walking speed 1.5x faster for 10 seconds (and Skip sandwich DX keeps the same effect for 20 seconds). Faster speed allows us to pass through a cliff which cannot be passed in normal speed (the cliff near the tunnel before Threed, for instance). The maximum speed of teleportation exceeds eight pixels per one frame. It allows us to go through a thin wall, in certain pixel positioning. You can go through the gap of some cliff. Read gocha's note for details. Everything in EarthBound is in one large map. Whenever you walk through a door/cave-entrance/hole in the floor, the game warps you to where its destination is. Now, when Ness & co. step onto a staircase (like those under Threed or in the pyramid), they automatically move forward a bit & "lock" onto the staircase, so that they can only walk up or down diagonally. If the game interrupts that locking procedure (by telling you someone's HP is getting critical due to poison/cold/etc. -- possibly other things like your Dad calling you could also work), then control gets messed up, and Ness & co. get "ghosted". While ghosted, you can freely walk through anything, and directly walk around the map posted above with impunity. Most areas will appear pitch black due to having a different tileset than what is currently loaded, but you can reset the tileset by using the Town Map (if standing in an area that shows up on it) or the Sound Stone. You can hear the music of whatever area you're in, so that can help you orient yourself. In order to unghost yourself, you must go through a door or warp somehow (death, use an Exit Mouse, teleport). Doors only exist in areas with loaded tilesets. Some rules -- don't go out of bounds. It will likely freeze. Also, you can never go below where you activated the glitch -- I guess the game tries to lock you onto the staircase, and gets confused when you're nowhere near it. This "can't go below" line stays in effect after unghosting yourself, and also when warping via doorways, teleport, etc. So don't enter the Threed hospital after starting the glitch in the Threed underground passageways. You can clear this "don't go below" line by heading back to where you started the glitch & walking onto the staircase normally -- everything goes back to normal completely when you do so. Now, you can start the glitch, and then (provided the area isn't below you) immediately stroll right up to Giygas's lair. Use the Sound Stone to refresh the area (if you need to), walk in & out of the doorway to unghost yourself, and fight Giygas. ...except that the game will freeze on the first prayer cutscene. As you play, the game sets or unsets "flags" that it can check later to see if you've done certain things. The flag that is required for the prayer cutscenes to work is set when you travel back in time in the Phase Distorter. But we can't just glitch-warp to where Poo learns PSI Starstorm omega, as the only doorway to unghost yourself is on the wrong side of the chasm. So we need to use the Phase Distorter in Saturn Valley. This requires (1) dropping down the hole into the Lost Underworld (this sets a flag that gets Apple Kid & Dr. Andronuts to appear in Saturn Valley), and (2) beating Ness's Nightmare in Magicant (this sets a flag that gets Dr. Andronuts to ask for the meteor piece). Thus, the game involves rushing through until we're able to glitch-warp, dropping down the hole to the Lost Underworld (and death-warping back to Threed), glitch-warping to Magicant & beating Ness' Nightmare, and then continuing the game like you normally would after finishing Magicant. Cracked bat available in Tracy's room must be acquired. If not, Pokey will tell the player the importance of the item equipment, which slows down the time. Most of the land-walking enemies can be avoided with Stutter stepping. Repeat the operation of the direction move for 7 frames, emptying the next frame, and operating again for 7 frames. This avoids Coil Snake at the entrance of Ness' house. The Titanic Ant guarding the Giant Step has 235 HP, so the Bomb available from the Attack Slug is quite useful. Attack Slug drops it every 1/128 chance, and we successfully gets two Bombs with B-Button RNG manipulation and Zigzag stepping. Using Bombs deals 90±50% damage, the maximum damage is 135. Carefully manipulate the RNG to defeat Titanic Ant in two turns without any damage. After gaining the Giant Step's melody, spawn two Black Antoids and use Deaths Warp to quickly move to Onett police station. We withdraw cash we has collected in the meantime and buy a cold remedy. This will be used later in the Threed to stop the Ness' cold after using the Stairs Glitch. After buying cold remedy and paying the remaining $198, we buy five Skip sandwiches, and ate one them, then passed through Twoson and forced into the Threed. Take the Pop gun from the locker and buy two Skip sandwich DXs with the money that sold it. That Skip sandwich DX is used to wall-clip on the cliff in front of Dr. Andonuts' lab, which saves about 20 seconds compared to passing through the Rainy Circle cave normally. Now we use Stairs Glitch to pass through Lumine Hall. Because we have to use Death Warp as soon as we pass through Lumine Hall, we intentionally kill Paula in a Urban Zombie and Zombie Possessor battle. Jeff's Spy option will rob Secret herb from Zombie Possessor to revive Paula later. Then we can use Stairs Glitch twice to go to Lumine Hall by getting Ness and Jeff to catch a cold. If Stairs Glitch is successful, you will not be able to interact with the NPC or enemies. Since you can get back to the normal by touching the door or stairs, we fly to the Flying Man's room instead of where the Magicant is. Ness' Nightmare has no immunity to PK Flash, so Paula's pray, which causes confusion state, drives Ness' Nightmare to self-destruct. 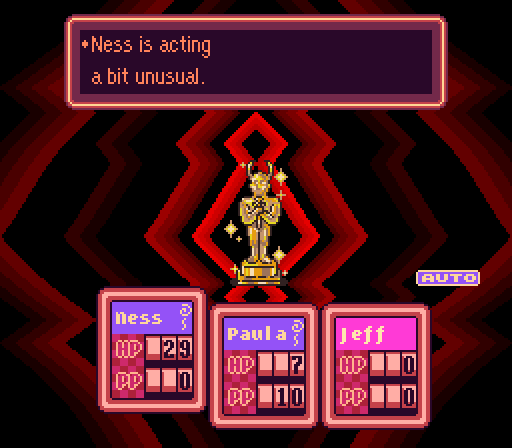 For the growth of Ness, Ness intentionally kills Paula. Before teleporting to Onett to find a Meteorite piece, the Saturn Valley was not added to the teleport list, so leave the Saturn Valley for a moment and go in again. A wall-clip with teleport saves the time to reach Meteorite piece. Events with the master of a Poo can skip to Stutter stepping. Then eat all of our saved Skip sandwiches and head for Giygas. It is useful to Ness' SMAAAASH!! attacks to knock down Heavily Armed Pokey and Giygas of the second phase. As the probability of SMAAAASH!! is proportional to Guts, so robs Gutsy bat (increased Guts 100) from Bionic Kraken which was drops with 1/128 chance. Paula's pray to cause everyone to asleep is used to beat Heavily Armed Pokey without any damage to Ness & co. Heavily Armed Pokey's stinky gas reduces the Ness' offense by 10, Ness can inflict 385 damage each SMAAAASH!! attacks. With five SMAAAASH!! attacks and Paula's PSI Freeze α, Heavily Armed Pokey will be awarded a total of 2000 damage and go to the next phase. Originally, in the second phase, Giygas is not affect by Paula's "Dazzling light chased the enemy" pray, after the second phase begins after praying in the first phase, the damage determination in the first phase is taken over as the second phase, and we can do the airway damage to Giygas. In the third phase, Giygas skips the turn without doing anything with a probability of about 1/4. Carefully manipulate the RNG to continue Paula's pray without any damage. When Paula asks Ness to take her home, we can choose No to reduce Paula's dialogue. When we get to Ness' house, use teleport to skip the photographer's appear and Paula's extra dialogue. Immediately after I submitted this movie, pirohiko showed a new Walk Through Walls glitch. Since the glitch can be applied from about the beginning of the run, it will took a long time to complete the new movie. First of all, I experimented with using regular Skip sandwich instead of Skip sandwich DX to reach Lumine Hall. Unfortunately, Ness & Co died of cold damage before reaching Lumine Hall, also it seems that I will need to modify the route that was commonly used to get the Bomb from the Attack Slug. In other words, a new movie will literally take a long time to come out. This is the first time I have written such a long text in a foreign language. Please understand even if there are grammatically awkward or wrong sentences. Memory: Optimization seems good, nice improvement. 5-7 minutes of improvements were found that are not included in this TAS, but they were found after the movie was completed and would require redoing almost the entire movie to include these improvements. Given that no other records beat this movie currently, it should be fine for acceptance in that regard. The audience received this movie well and the current TAS is Stars so that is where this is going.